Before the FIFA Congress could vote on the first-ever World Cup host, a series of withdrawals led to the election of Uruguay. The Netherlands and Hungary withdrew, followed by Sweden withdrawing in favour of Italy. Then both Italy and Spain withdrew, in favour of the only remaining candidate, Uruguay. The FIFA Congress met in Barcelona, Spain on 18 May 1929 to ratify the decision, and Uruguay was chosen without a vote. Notice that the celebration of the first World Cup coincided with the centennial anniversary of the first Constitution of Uruguay. For that reason, the main stadium built in Montevideo for the World Cup was named Estadio Centenario. Sweden decided to withdraw before the vote, allowing the only remaining candidate Italy to take the hosting job for the 1934 World Cup. The decision was ratified by the FIFA Congress in Stockholm, Sweden and Zürich, Switzerland on 14 May 1932. The Italian Football Federation accepted the hosting duties on 9 October 1932. Without any nations withdrawing their bids before the vote, the FIFA Congress convened in Berlin, Germany on 13 August 1936 to decide the next host of the World Cup. Electing France took only one ballot, as France had more than half of the votes in the first round. Cancelled FIFA election of the host due to the outbreak of the Second World War in September 1939. Brazil, Argentina, and Germany had official bid for the 1942 World Cup, but the Cup was cancelled after the outbreak of World War II. The 1950 World Cup was originally scheduled for 1949, but the day after Brazil was selected by the FIFA Congress on 26 July 1946 in Luxembourg City, Luxembourg, the World Cup was rescheduled for 1950. The 1951 World Cup hosting duty was decided on 26 July 1946, the same day that Brazil was selected for the 1949 World Cup, in Luxembourg City. On 27 July, the FIFA Congress pushed back the 5th World Cup finals for three years, deciding it should take place in 1954. Argentina, Chile, Mexico, and Sweden expressed interest in hosting the tournament. Swedish delegates lobbied other countries at the FIFA Congress held in Rio de Janeiro around the opening of the 1950 World Cup finals. Sweden was awarded the 1958 tournament unopposed in on 23 June 1950. West Germany withdrew before the vote, which took place in Lisbon, Portugal on 10 June 1956, leaving two remaining bids. In one round of voting, Chile won over Argentina. Spain withdrew from the bidding prior to voting by the FIFA Congress, held in Rome, Italy on 22 August 1960. Again, there was only one round of voting, with England defeating West Germany for the hosting position. The FIFA Congress convened in Tokyo, Japan on 8 October 1964. One round of voting saw Mexico win the hosting duties over Argentina. Three hosts for the 1974, 1978, and 1982 World Cups were chosen in London, England on 6 July 1966 by the FIFA Congress. Spain and West Germany, both facing each other in the running for hosting duties for the 1974 and 1982 World Cups, agreed to give one another a hosting job. Germany withdrew from the 1982 bidding process while Spain withdrew from the 1974 bidding process, essentially guaranteeing each a hosting spot. Mexico, who had won the 1970 hosting bid over Argentina just two years prior, agreed to withdraw and let Argentina take the 1978 hosting position. Host voting, handled by the then-FIFA Executive Committee (or Exco), met in Stockholm on 9 June 1974 and ratified the unopposed Colombian bid. In Zürich on 20 May 1983, Mexico won the bidding unanimously as voted by the Executive Committee, for the first time in FIFA World Cup bidding history (except those nations who bid unopposed). Except Italy and the Soviet Union, all nations withdrew before the vote, which was to be conducted by Exco in Zürich on 19 May 1984. Once again, only one round of voting was required, as Italy won more votes than the Soviet Union. Despite having three nations bidding for host duties, voting only took one round. The vote was held in Zürich (for the third straight time) on 4 July 1988. The United States won the bid by receiving a little over half of the votes by the Exco members. This vote was held in Zürich for the fourth straight time on 1 July 1992. Only one round of voting was required to have France assume the hosting job over Morocco. On 31 May 1996, the hosting selection meeting was held in Zürich for the fifth straight time. A joint bid was formed between Japan and South Korea, and the bid was "voted by acclamation", an oral vote without ballots. The first joint bid of the World Cup was approved, edging out Mexico. On 6 July 2000, the host selection meeting was held for the sixth straight time in Zürich. Brazil withdrew its bid three days before the vote, and the field was narrowed to four. This was the first selection in which more than one vote round was required. Three votes were eventually needed. Germany was at least tied for first in each of the three votes, and ended up defeating South Africa by only one vote after an abstention (see below). The controversy over the decision to award the 2006 FIFA World Cup to Germany led to a further change in practice. The final tally was 12 votes to 11 in favour of Germany over the contenders South Africa, who had been favorites to win. New Zealand FIFA member Charlie Dempsey, who was instructed to vote for South Africa by the Oceania Football Confederation, abstained from voting at the last minute. If he had voted for the South African bid, the tally would have been 12–12, giving the decision to FIFA President Sepp Blatter, who, it was widely believed, would then have voted for South Africa. Dempsey was among eight members of the Executive Committee to receive a fax by editors of the German satirical magazine Titanic on Wednesday, the night before the vote, promising a cuckoo clock and Black Forest ham in exchange for voting for Germany. He argued that the pressure from all sides including "an attempt to bribe" him had become too much for him. On 4 August 2000, consequently, FIFA decided to rotate the hosting of the final tournaments between its constituent confederations. This was until October 2007, during the selection of the host for the 2014 FIFA World Cup, when they announced that they will no longer continue with their continental rotation policy (see below). The first World Cup bidding process under continental rotation (the process of rotating hosting of the World Cup to each confederation in turn) was the 2010 FIFA World Cup, the first World Cup to be held in Africa. On 7 July 2001, during the FIFA Congress in Buenos Aires, a decision was ratified, which was that the rotation will begin in Africa. 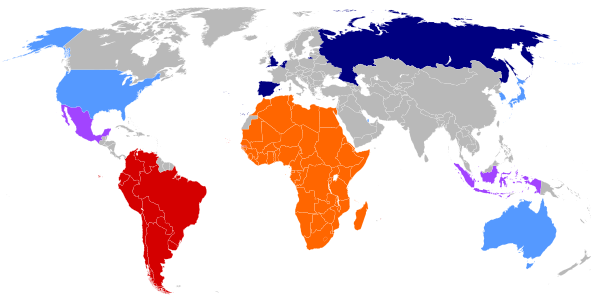 On 23 September 2002, FIFA's Executive Committee confirmed that only African member associations, would be invited to submit bids to host the 2010 FIFA World Cup. In January 2003, Nigeria entered the bidding process, but withdrew their bid in September. In March 2003, Sepp Blatter initially said Nigeria's plan to co host the 2010 FIFA World Cup with four African countries would not work. Nigeria had originally hoped to bid jointly with West African neighbours Benin, Ghana, and Togo. After it was confirmed by FIFA that joint bidding would not be allowed in the future, Libya and Tunisia withdrew both of their bids on 8 May 2004. On 15 May 2004 in Zürich (the seventh consecutive time that a host selection has been made there), South Africa, after a narrow loss in the 2006 bidding, defeated perennial candidate Morocco to host, 14 votes to 10. Egypt received no votes. On 4 June 2015, FIFA executive Chuck Blazer, having co-operated with the FBI and the Swiss authorities, confirmed that he and the other members of FIFA's executive committee were bribed in order to promote the South African 1998 and 2010 World Cups. Blazer stated, "I and others on the Fifa executive committee agreed to accept bribes in conjunction with the selection of South Africa as the host nation for the 2010 World Cup." On 6 June 2015, The Daily Telegraph reported that Morocco had received the most votes, but South Africa was awarded the tournament instead. FIFA continued its continental rotation procedure by earmarking the 2014 World Cup for South America. FIFA initially indicated that it might back out of the rotation concept, but later decided to continue it through the 2014 host decision, after which it was dropped. Colombia had expressed interest in hosting the 2014 World Cup, but withdrew undertaking the 2011 FIFA U-20 World Cup. Brazil also expressed interest in hosting the World Cup. CONMEBOL, the South American Football Federation, indicated their preference for Brazil as a host. Brazil was the only nation to submit a formal bid when the official bidding procedure for CONMEBOL member associations was opened in December 2006, as by that time, Colombia, Chile and Argentina had already withdrawn, and Venezuela was not allowed to bid. Brazil made the first unopposed bid since the initial selection of the 1986 FIFA World Cup (when Colombia was selected as host, but later withdrew for financial problems). The FIFA Executive Committee confirmed it as the host country on 30 October 2007 by a unanimous decision. FIFA announced on 29 October 2007 that it will no longer continue with its continental rotation policy, implemented after the 2006 World Cup host selection. The newest host selection policy is that any country may bid for a World Cup, provided that their continental confederation has not hosted either of the past two World Cups. For the 2018 World Cup bidding process, this meant that bids from Africa and South America were not allowed. For the 2022 World Cup bidding process, this meant that bids from South America and Europe were not allowed. Also, FIFA formally allowed joint bids once more (after they were banned in 2002), due to there being only one organizing committee per joint bid, unlike Korea/Japan, which had two different organizing committees. countries that announced their interest included Australia, England, Indonesia, Japan, Qatar, Russia, South Korea, United States, the joint bid of Spain and Portugal and the joint bid of Belgium and Netherlands. The hosts for both World Cups were announced by the FIFA Executive Committee on 2 December 2010. Russia was selected to host the 2018 FIFA World Cup, making it the first time that the World Cup will be hosted in Eastern Europe and making it the biggest country geographically to host the World Cup. Qatar was selected to host the 2022 FIFA World Cup, making it the first time a World Cup will be held in the Middle East and the second time in Asia. Also, the decision made it the smallest country geographically to host the World Cup. The bidding process involved several controversies. Two members of the FIFA Executive Committee had their voting rights suspended following allegations that they would accept money in exchange for votes. England and Russia's respective 2018 bids also were subject to controversy after England filed a complaint against a Russian official's comment, though the complaint was withdrawn following Russia's apology. More allegations of vote buying arose after Qatar's win was announced. World Cup-winning bids are bolded. Planned but not-yet-official bids for 2030 and beyond are not included. a. Bid by West Germany, which was joined by East Germany in 1990 to form the reunified nation of Germany. b. Joint bid by Argentina, Paraguay and Uruguay. c. Colombia was originally chosen to host the 1986 World Cup, but withdrew from hosting due to economic concerns. After a second bidding, Mexico was selected as the replacement host. e. Joint bid by Portugal and Spain. f. Joint bid by Japan and South Korea. g. Joint bid by Belgium and the Netherlands. i. Joint bid by Libya and Tunisia. In September 2007, the rotation system came under review, and a new system was proposed which renders ineligible for bidding only the last two World Cup host confederations. This proposal was adopted on 29 October 2007, in Zurich, Switzerland by FIFA's Executive Committee. Under this policy, a 2018 bid could have come from North America, Asia, Europe, or Oceania, as Africa and South America are ineligible.] Likewise, no CONMEBOL member could have made a 2022 bid, and candidates from the same confederation as the successful 2018 applicant would be disregarded in the 2022 selection procedure. On 31 October 2007, The Football Association officially announced its bid to host the event. On 24 April 2008 England finalised a 63-page bid to host the 2018 World Cup, focusing on the development of football worldwide. On 27 January 2009, England officially submitted their bid to FIFA. Richard Caborn led England's bid to stage the event after stepping down as Sports Minister. On 24 October 2008 the Football Association named the Executive Board to prepare the bid, with David Triesman as the bid chairman. Triesman resigned on 16 May 2010 after comments were published where he suggested that Spain would drop their bid if Russia helped bribe referees in the 2010 FIFA World Cup, and was then replaced by Geoff Thompson. FIFA officials also expressed interest in an English bid. David Will, a vice-president of FIFA, noted England's World Cup proposal as early as May 2004. Franz Beckenbauer, leader of Germany's successful bid for the 2006 World Cup and a member of FIFA's Executive Committee, twice publicly backed an English bid to host the World Cup, in January and July 2007. FIFA President Sepp Blatter said he would welcome a 2018 bid from "the homeland of football." Blatter met David Cameron on two occasions to discuss the bid while paying visits to England. The British Prime Minister showed much support for the bid and was hopeful that the "home of football" would host the tournament. Australia's largest stadiums are currently used by other major Australian sports whose domestic seasons overlap with the World Cup. The Australian Football League and National Rugby League claimed that loss of access to these major venues for eight weeks would severely disrupt their seasons and impact the viability of their clubs. The AFL in particular had previously advised it would not relinquish Etihad Stadium in Melbourne for the entire period required. On 9 May 2010 the AFL, NRL, and FFA announced a Memorandum of Understanding guaranteeing that the AFL and NRL seasons would continue, should the bid be successful. Compensation for the rival football codes would be awarded as a result of any disruptions caused by hosting the World Cup. AFL CEO Andrew Demetriou came out in support of the bid, despite initially not supporting the bid. Franz Beckenbauer indicated that the issue of factional disputes between the FFA, NRL and, AFL were not considered by the FIFA Executive Committee. Although initially Australia seemed to be a popular contender to host the tournament, the final Australian World Cup bid received only one vote astonishing Franz Beckenbauer and experts alike. South Korea bid only for the 2022 World Cup. They were bidding to become the first Asian country to host the World Cup twice; however, the fact that they were co-hosts so recently in 2002 was expected to work against them in their bid. Seungjoo Han, a former South Korean Minister of Foreign Affairs, was appointed as the Chairman of the Bidding Committee in August 2009. He met with FIFA President Sepp Blatter in Zürich, Switzerland. In January 2010, the president Lee Myung-bak visited the headquarters of FIFA in Zurich, Switzerland to meet Sepp Blatter in support of the South Korean bid. Although South Korea did not have an 80,000 capacity stadium, it planned to upgrade an existing venue to meet that capacity. There are three grounds which can seat over 60,000 people—Seoul Olympic Stadium, Seoul World Cup Stadium and Daegu Stadium. Another 70,000 seat stadium is scheduled to be built in Incheon as the main stadium for the 2014 Asian Games. Other venues meet hosting requirements as they were built for the 2002 World Cup. The 12 Cities selected to hold the finals were South Korea to win the bid were selected in March 2010 and were Busan, Cheonan, Daegu, Daejeon, Goyang, Gwangju, Incheon (2 Venues), Jeonju, Jeju, Seoul (2 Venues), Suwon and Ulsan. The bid was launched at a moment when there were strong pressures from Indonesian football fans for Halid to step down from his position as chairman of PSSI. There was no official support from the government of Indonesia until 9 February 2010, the deadline for the country's government to file a letter of support for the bid. Secretary General of PSSI Nugraha Besoes did not deny that Indonesia could be disqualified from the bidding process because the Indonesian government did not support the bid. On 19 March 2010, FIFA rejected Indonesia's bid to host the 2022 World Cup because the government stated that their concern is for the people of the country and so could not support the bid as FIFA requested.] As a consequence, PSSI threw their support behind Australia's bid for the 2022 tournament. Roger Burden, who had been acting chairman of England's Football Association, withdrew his application for the permanent post days after the vote, saying he could not trust FIFA members due to their actions. England's bid executive Andy Anson said "I think it has to [change] because otherwise why would Australia, the United States, Holland, Belgium, England ever bother bidding again?" There was also a backlash from the media in the losing countries; the majority of British newspapers alleged that the World Cup had been "sold" to Russia, and the Spanish El Mundo, Dutch Algemeen Dagblad, the American Seattle Times and Wall Street Journal, and the Japanese Nikkei made comments about Russia and Qatar's commodity and energy reserves. Bayern Munich President Uli Hoeneß said that Blatter "has lost control" of FIFA and that "It's a scandal how things run there (at FIFA). Apparently, a bid nowadays can only be successful if payments are additionally made under the table. One scandal comes on the heels of another." On 10 May 2011, the former England 2018 bid chief Lord Treisman told a House of Commons select committee that four FIFA committee members approached him asking for various things in exchange for votes. Among the accused are FIFA Vice President Jack Warner, who is accused of asking for £2.5 million to be used for projects, and Nicolas Leoz, who allegedly asked to be knighted. In November 2010, a documentary broadcast by the BBC had alleged that FIFA officials voting on the World Cup bids had received large bribes between 1989 and 1999, which FIFA had not investigated and that FIFA requires bidding countries to agree to enact special laws granting FIFA and sponsors tax benefits. The whistleblower at the centre of the allegations was later revealed to be Phaedra Almajid, who claimed that she had fabricated the claims of corruption in order to exact revenge on the Qatari bid after being relieved of her campaign job on the team. She signed a legal affidavit and claimed that she decided to go public with her admission because her "lies had gone too far." FIFA confirmed receipt of an email from Almajid stating her retraction. Having originally claimed African Football Confederation president Issa Hayatou, Ivorian FIFA member Jacques Anomua and Nigeria's suspended exco official Amos Adamu were paid $1.5m to vote for Qatar, Almajid went on to say "I cannot tell you how sorry I am. I have hurt reputations of three members of the Fifa [sic] exco, I have hurt their reputation, and more importantly I have hurt my colleagues on the Qatar bid." She also stressed that she had not been put under any pressure by the Qatari bid team or anyone else to make a retraction. John Whittingdale, the chairman of the House of Commons select committee for culture, media and sport, stood by the decision to publish the allegations against Qatar and the three executive committee members despite the retraction.